I LOVE shrimp. Honestly to be fair I love all seafood. Whenever I eat out I go right to the seafood selections no matter the restaurant. I want to see what is on the menu and if it looks tasty I will try it. Shrimp seems to be the one seafood that is offered the most on the menus. I knew that the Endless Shrimp promotion was going on at Red Lobster and lucky me I participated in a campaign on behalf of Mom Central Consulting for Red Lobster. I received a gift card to facilitate my review promotional item as a thank-you for participating..... to go eat shrimp. How could I pass up eating shrimp? I didn't! 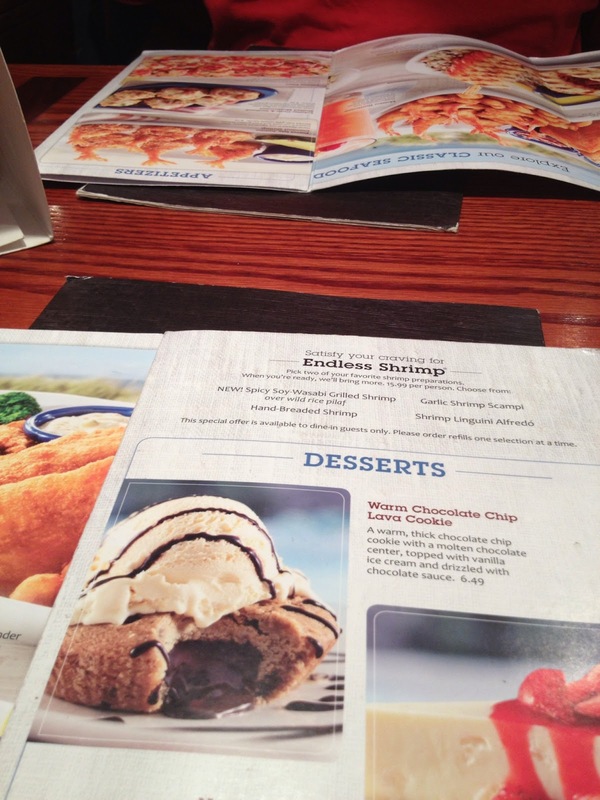 This past week I took hubby out on a date to Red Lobster. Yep I was paying and told him to order whatever he wanted. I was there for the Endless Shrimp meal! I really didn't believe that I could order all the shrimp that I could eat but it was totally true. 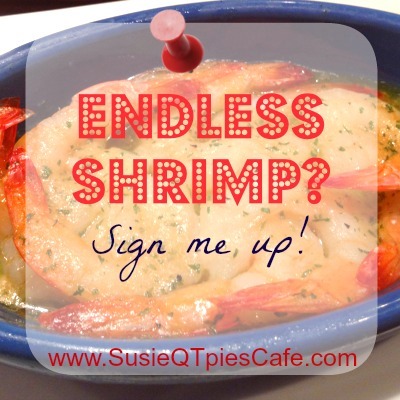 All I could picture was a sign saying,"sorry endless shrimp promotion is over," as I walked in the door! The promotion is still going strong and this is their 12th year to have this summer promotion. So what is the Endless Shrimp meal? The meal is $15.99 and comes with a huge salad, famous Cheddar Bay Biscuits, 4 ENDLESS shrimp options and a side. 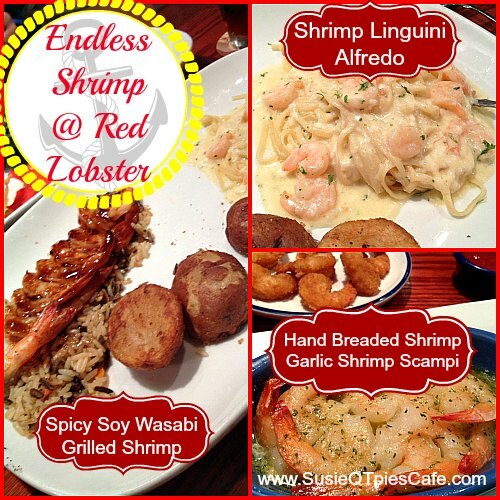 The shrimp choices were Spicy Soy Wasabi Grilled Shrimp, Hand Breaded Shrimp, Garlic Shrimp Scampi and Shrimp Linguini Alfredo. I love wasabi and enjoyed the new Spicy Soy Wasabi Grilled Shrimp. Wasabi can be over powering but it really wasn't in this selection. The wasabi added just a little kick to the grilled shrimp. I'm also a sucker for Alfredo sauce and my #2 favorite was the Shrimp Linguini Alfredo. 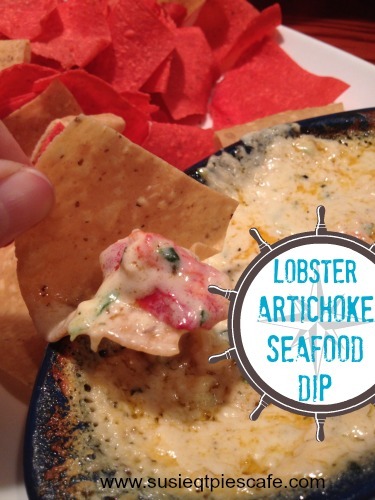 We did kick off our meal with the Lobster Artichoke Seafood Dip which was tasty. It comes with a side of pico so if you don't get it, just ask because they give you an insane amount of taco chips and you'll want it. They have tasty signature drinks but I had to save room for my endless shrimp. Next time I'm getting one of these drinks instead of an appetizer! lol Such tough decisions! We were too stuffed for dessert or I would have for sure had the Warm Chocolate Chip Lovers Cookie. When was the first time you went to Red Lobster? Mine was in 1989 on a date with a guy in college. 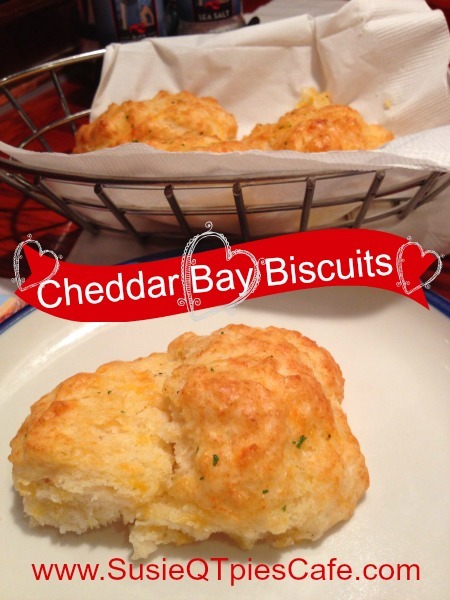 When was the last time you ate at Red Lobster? What is your favorite menu item? I'd have to say mine is the Wasabi Grilled Shrimp AND of course the Cheddar Bay Biscuits. Follow along with Red Lobster on Twitter and Facebook to keep updated on their tasty promotions!